When it comes to homework there are a couple of ways for your students to hand them in using Google tools. The most convenient way is probably when the school uses Google Apps and the students simply share their own folders, or a teacher sets up folders for their students with the gclassfolders script. However, more often it is the case that not all students in your class use Gmail and Google Drive. In that case you could a web form like Dropzone where the students can upload their files to your Google Drive without signing in or even having to have a Google account. The most common way of handing in homework is, however, via email. There are a number of drawbacks when it comes to managing homework in your email inbox. It would be much more convenient to have the files in your Drive and, of course, on your PCs hard drive if you use the desktop version of Google Drive. 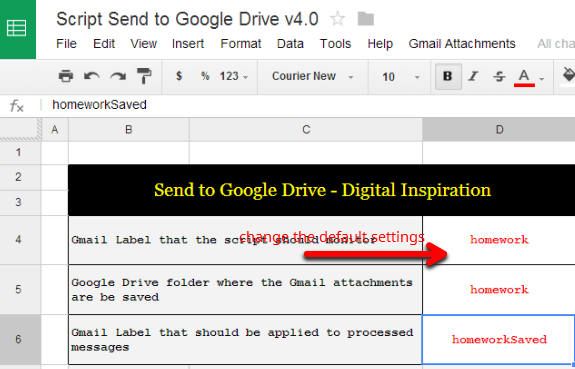 Google doesn’t provide the possibility to save files via Gmail, however there is a great third party script which fulfills this functionality. If you collect homework via Gmail, you might already be working with labels anyway. If not, here is what you have to do. Create a label (there is a link under Inbox and all your other labels), say. “homework”. Then create a filter with “contains the word “homework”” (I also have a second one with “HW”) and choose apply label “homework”. Apart from collecting homework you can also use the script for mobile uploads from your students (e.g. photos, podcasts or short videos). The script runs every five mintues, so you might have wait a while before you see uploads in your Drive. If you do audio podcasts with students who use iPhones, it is the only way of collecting the files in your Drive directly. iOS doesn’t allow direct access to your files other than photos and videos. So, the students can’t upload them neither to their own Drives nor via a web form. The script has another advantage: it also saves homework from all past emails and thus creates an archive of past email. I move the old files into a separate folder (homework archive). Of course, you can also delete them, if you don’t want to keep a copy of your students’ homework.